The Carnival Corporation is the largest cruise company in the world and operates several different brands. The cruise line ‘Carnival Cruise Lines’ has the largest fleet in the group with 30 vessels. The fleet sails almost exclusively in the seas of North America and the Caribbean. For Carnival Cruise Lines the guest's experience of the ships is at least as important as the visited destinations. The concept is comparable to a club holiday and convinces an active, mostly younger audience. The ships offer a colorful world of experience including high-quality food, award-winning entertainment and excellent child and youth care. On board you will find mostly Americans. 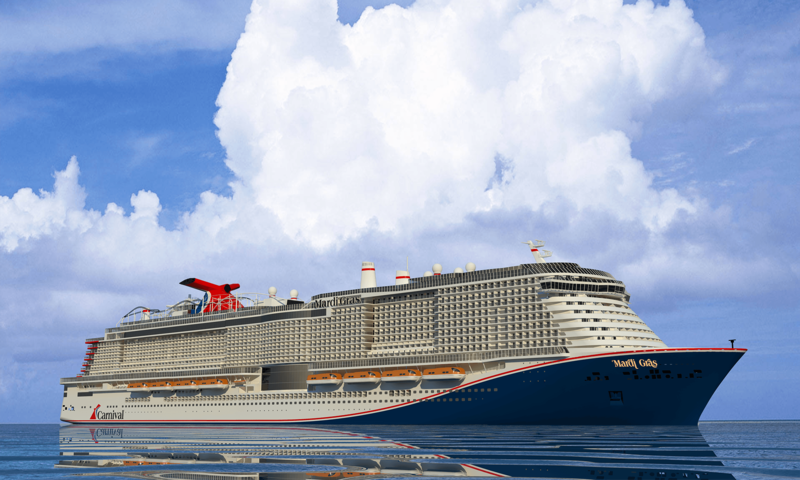 The Mardi Gras will start her journey in 2020 and accomodate up to 5.282 passengers. The Mardi Gras is divided in different themed zones. The zone "Grand Central" consists of the atrium with floor-to-ceiling windows. The "French Carter" serves dishes from New Orleans. The quartier "Summer Landing" is perfectly for relaxing. The zone "La Piazza" is inspired by the italian attitude. You can swim and relax in the Lido zone. The "Ultimate Playground" is the zone for fun with the first rollercoaster on sea. The dress-code reflects this concept: casual attire is perfect for almost any situation. Only for dinner in the main restaurants a more elegant style is recommended. There are even one or two festive evenings, where evening dress is required, but you may easily escape this when not dining in the à la carte restaurants. Though guests come from all over the world, usually most people on board are US citizens. You can be sure that you will be entertained very well. Las Vegas style shows in the grand show lounge, thrilling games in the casino, freshly mixed cocktails in one of the lounges, your talent shown in the Karaoke bar or on the dancefloor to live music - Expect it all and get it all. Of course the Mardi Gras offers many ways to relax, such as the spa area where a wide choice of treatments is offered. For those who feel the urge to move the fitness area and sporting facilities are great choices. The great cuisine, diversified entertainment options as well as the appealing and modern interior make the Mardi Gras a destination in itself. This ship demonstrates impressively what is possible on cruise ships nowadays.